Even before George Mason College’s split from the University of Virginia it was looking to expand its horizons. Enrollment, which had been increasing steadily, was growing at a much faster rate than the college’s budget or construction plans. Alhough there were plans for new buildings in the future, student body and program growth outpaced that of the physical plant. The need for more space caused the college to look into purchasing a “surging space,” an area where programs and classes could temporarily meet until construction at the permanent site on the main campus was completed. Negotiations between the City of Fairfax and the George Mason Foundation, took place in early January 1972 regarding the former Fairfax High School building. The thirty-five-year-old school building, which sat on sixteen acres on Route 50, had been replaced by a new high school two miles to the west, but the city wished to put the old building to some use and wanted it to remain as an educational building. In a shrewd example of deal-making, the George Mason Foundation purchased the building in January 1972 for the appraised price of $1.8 million and rented it to George Mason College. The Virginia General Assembly appropriated the necessary funding for the rental of the building. These expanding academic programs included the Department of General Studies (which fell under the College of Professional Studies), new medical technology programs, and graduate programs in Business Administration, Education, Special Education, and Guidance. There was even talk of a law school starting at the former high school. Two new undergraduate programs, Secondary Education and Health and Physical Education, were to be implemented in the fall of 1973. The North Campus also became home to the School of Fine and Performing Arts. Dr. Hale Tongren, chairman of the department, expected an enrollment increase of 30-40% in the Business Administration program and the establishment of a separate School of Business Administration within four to five years. Further growth would prove difficult at the North Campus, however, because this “surging space” was already suffering from a lack of parking, and the situation would only get worse. Students had to return to the main campus for electives, and the distance from North Campus, about four miles, was not conducive to walking. Administrators debated lengthening the time period between classes to twenty minutes, but eventually decided to bus students to and from the campuses instead. When he visited the Nort Campus site in 1972, Freshman President Ronny Acker called it “anti-educational in spirit” and “judged [it] potentially disastrous to the aesthetic evolution of the student’s mind.” The university allotted funds for renovations, and although the School of Fine and Performing Arts seemed to appreciate the facilities, many members of the School of Business Administration expressed growing discontent. They cited the “decrepit high school building where the lights are too dim, rooms are too hot, business facilities (especially the computer room) woefully inadequate and classrooms too crowded” among their chief complaints. They also believed that there were too few teachers and were upset that the North Campus and its students and faculty had received no coverage in the Advocate, the student yearbook, the previous year. The yearbook’s editor said that issue would be corrected, and senior business students Jeff Hetrick and John Willet formed the North Campus Improvements Committee to help address the students’ concerns, which they felt were especially relevant because “[business students] account for nearly one-fourth of the student body, yet we are awarded a mere 12% of available funds.” While the university sought to appease some requests, one problem they could not fix was a widely-held conviction: “It’s [North Campus is] kind of closed off from everybody. They ignore us…we’re over here by ourselves.” That issue remained unresolved until George Mason brought all students from North Campus back to the Fairfax Campus. North Campus was later sold to the Catholic Diocese of Arlington to become Pope Paul VI High School in 1983. During the North Campus period, Acting President Dr. Robert Krug suggested further expansion in Arlington with the establishment of an East Campus which would be similar in size and function to the North Campus. And like North Campus, and Bailey’s Crossroads fifteen years before, it might be the acquisition of an older abandoned school building. It was an idea that he did not see come to fruition during his tenure. His Arlington initiative, however, overlapped with another project, the acquisition of a law school there, which was approved by the Virginia General Assembly in 1979. 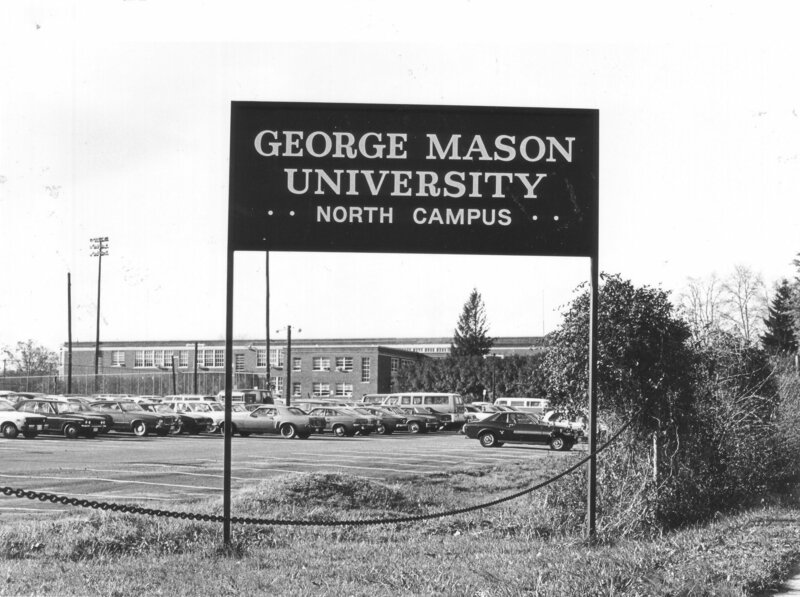 Although the North and Arlington Campuses would serve very different purposes, they both served as a testament to increasingly important aspects of George Mason’s identity: academic and geographic expansion and the eagerness to introduce new and innovative programs. Browse items pertaining to George Mason University's North Campus. The George Mason Foundation is a non-profit fund-raising organization chartered in 1966 and dedicated to raising funds for the advancement of George Mason.